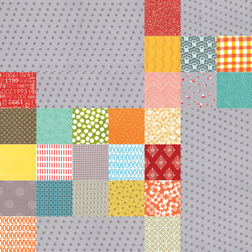 baby quilt in progress…. It looks like it is finished but we are just waiting for the little boy to be born so I can add his name, date of birth, etc in the big empty grey area. 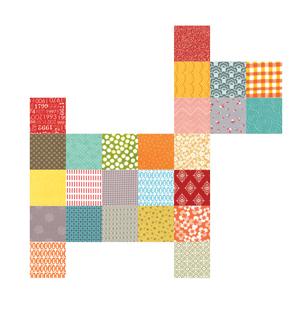 When I learned that Holly was having a boy and doing her nursery in dogs, I thought of the patchwork dog pillows that you see in antique stores. I knew I couldn’t tackle the box type pillow and all those set in seams, so I decided to make the quilt above. 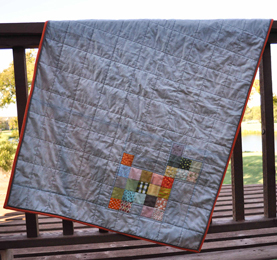 This is a perfect project to make using any of your 2 1/2″ jelly roll scraps. Block measures 14″ finished. Each print square is 2 1/2″ x 2 1/2″ cut. This block uses white as the background. 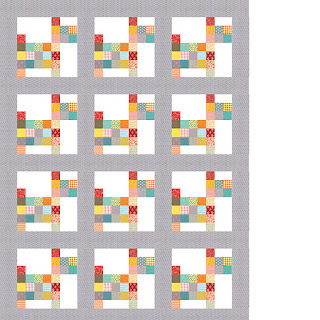 This block uses Grey as the background since Holly’s nursery is grey. If you are a grey junkie, you will want an entire bolt for yourself. I promise. If you are interested in making some dog blocks, the above diagram shows the basic cutting and piecing directions for one block. 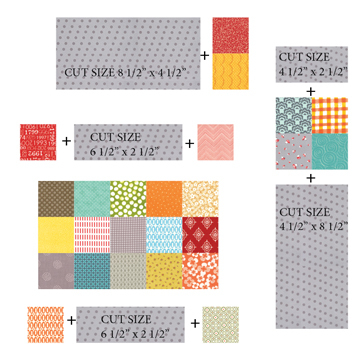 All print blocks are cut 2 1/2″ square. 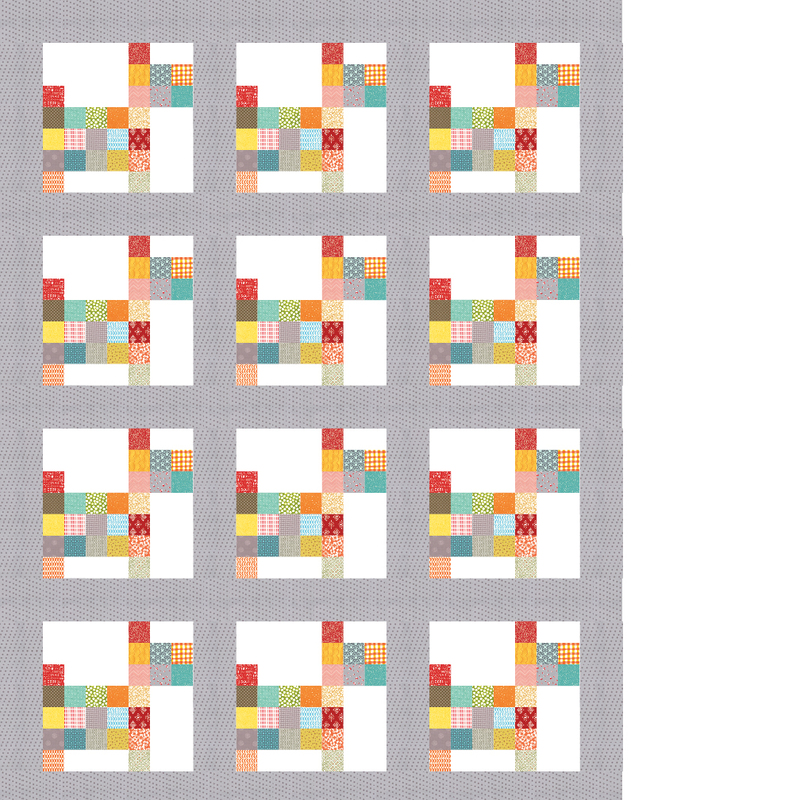 Here is a diagram of 3 blocks across, 4 blocks down with 2″ finished sashings.This diagram makes a quilt that is 50″ x 66″. That is one gorgeous quilt. What a great design using 2 1/2" scraps. I am looking forward to Aneela's new collection – a walk in the woods. I like the little fox print. that is really cute. i have a scottie dog in real life so my kids would really like this. I have made a dog pillow from reproduction prints so now I may have to make the quilt to go with it. Thanks for the tut. Great idea for a baby quilt! Beautiful! I can't wait to see the grey at Market! I definitely a grey junkie! That is so cute! And wow, does it bring back the memories. We had a stuffed dog like that, and we used to fight over who got to play with it. A well-loved little doggie, it was — a quilt like that would be fun to make. That's just adorable — I can't wait to make one!